Attack on Titan: The Last Wings of Mankind was released in Japan just over a year ago. When I looked at it, the biggest problem was that the majority of the game was designed for local co-op—and I lacked three friends interested in playing it. Luckily, in this year’s updated release, the co-op is now playable online. When you start playing the “world mode” missions—i.e., those outside the story missions—you begin by creating a character. You choose gender, skin color, body size, hair color, and costume—or simply select the model of an Attack on Titan character you have unlocked in the main story. However, regardless of what your character looks like, he or she plays terribly at the start when compared to the characters in story mode—your multiplayer character is slow, weak, and will burn through gas at an insane rate. What were easy Titan kills with Mikasa or Eren suddenly become painfully difficult—hence why it's nice to have a co-op team. Of course, as you play, your character will level up, allowing you to boost your movement speed, attack power, and several other stats. On top of that, as you kill Titans, you'll come across materiel that will let you build new maneuver gear and more powerful sword blades. Eventually, you'll find your character putting those characters in the single player modes to shame. While it is possible to play these missions alone or with AI teammates, the real joy of the mode comes through co-op play with other players. Each level can be played with up to four players. There are several possible objectives—protecting a point, rescuing injured people, or taking out specific targets—but most often the goal is as simple as eliminating every Titan you see. With real human partners, it really becomes a race for bragging rights: who can take down the most before the mission ends. But even with that going on, I've found that people still play as a team—so if a Titan gets you in its clutches, your teammates will run to your rescue. Occasionally, you'll even run into a special target that cannot be easily killed alone. However, with a coordinated group, one can hamstring it, while another cuts out the eyes, and a third goes in for the kill. When everything goes according to plan, it really is an awesome feeling. Perhaps the oddest thing about the co-op multiplayer is the simple fact that the levels are short—and I mean really short. It's rare that any co-op level takes over a minute to complete with a full team. Then it's back to the lobby menu where the party leader selects a new level and everyone dives in again. The loading time is minimal, so it rarely gets boring—unless someone forgets to ready up, of course. There is, however, one notable problem with the online mode—the matchmaking. When you start a new character, you are only able to access the level 1 missions. However, if you use the quickmatch feature to find a group, there's a good chance they will be doing missions you have not yet unlocked and thus are not allowed to participate in. Moreover, when trying to host a game myself, I have never once had anyone join my game regardless of the filters I've used. And when I have tried to use more specifics for a group search, the game simply crashed every time—even after updating both the firmware and game. (However, there is chance this crashing is because I have a modded 3DS and therefore it may not be a problem with the game itself.) Thus, I have found it incredibly difficult to find a team of the same level—and once I do find one, I tend to stay with it as long as possible to unlock as many levels as possible. 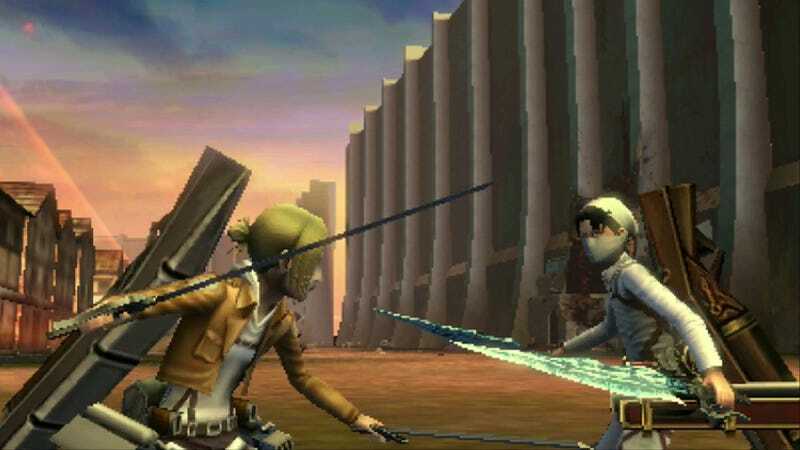 So while finding a team playing the levels you want to play can be difficult, once you do, I find that the co-op play of Attack on Titan: The Last Wings of Mankind -Chain- is always a surprising amount of fun.